Today’s recipe is from Nick Malgieri’s Pastry: Foolproof Recipes for the Home Cook . 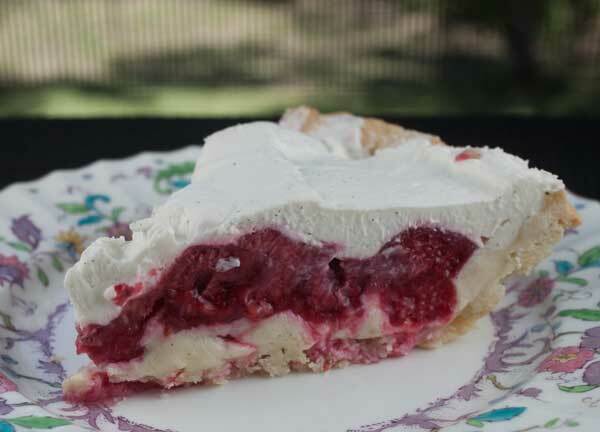 From top to bottom, it has a layer of vanilla flavored whipped cream, cooked raspberries, a simple (and very good) vanilla pastry cream and an interesting pie crust made with flour, salt, baking powder, butter and eggs – no water. In fact, the dough for this pie crust comes from what Nick Malgieri calls “a whole new generation of doughs” which he invented for home bakers. Along with the Flaky Buttery Dough that goes with this pie, there’s a savory crust made with olive oil (Malgieri calls it his new favorite), a modern take on a lard crust, a sour cream dough, a yeast risen dough and many, many, more. But it’s not all pie dough. 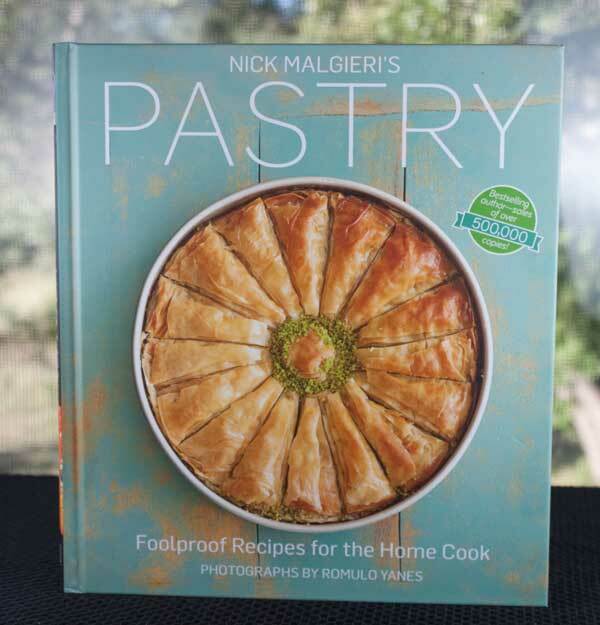 The book starts with the basic pie dough and eases the reader into strudel dough, puff pastry, thin dough similar to phyllo (yikes) and brioche using even more of Malgieri’s new, user-friendly doughs. I’ll be baking from this book for years to come and hope to eventually master croissants. For now, here is the pie recipe. I’ve paraphrased a bit to note a few things I had to do differently. For instance, I was stuck using reduced fat milk for the pastry cream, yet it worked just fine. I didn’t strain the pastry cream and paid the price with some lumps (nobody noticed), and I used powdered sugar in the whipped cream topping. So even with my little alterations, the pie was a hit and I hope we finish it soon so I can move on to another recipe. Make the crust first. You'll only use half of this recipe (1 round ) for the pie. Combine the flour, salt, and baking powder in the bowl of a food processor; pulse several times at 1-second intervals to mix. Add the butter and pulse again 3 or 4 times. Use a metal spatula to scrape the side of the bowl and mix the butter pieces throughout the flour. Pulse again 3 or 4 times. Using a fork, beat the eggs to break them up, and add to the bowl. Pulse again until the dough almost forms a ball; avoid pulsing too much, or the pieces of butter needed to make the dough flaky will become too small. Invert the dough onto a lightly floured work surface, carefully remove the blade, and quickly press the dough together. Divide the dough into 2 pieces, form into thick disks, and wrap each in plastic. Chill for a couple of hours before rolling. Prepare your pie shell by rolling it into a 12 inch circle, laying it over a 9 inch pie pan (not deep dish), trimming and crimping. At this point, it’s a good idea to freeze the shell for an hour or until ready to use. This will help prevent shrinkage. To bake the pie shell, prick the frozen crust with a fork, then cover the frozen crust with parchment paper. Weigh down the middle with pie weights or beans and let the parchment loosely cover the edges. Bake at 375 degrees F for 15 minutes, then remove weights and parchment and bake uncovered until golden brown. To make the raspberry filling, combine 1/3 of the berries and the sugar in a nonreactive saucepan and mash. Place over low heat and bring to a simmer. Meanwhile, whisk the water and cornstarch together. When the berries begin to boil, stir a third of the juices into the cornstarch mixture. Continue stirring until the juices thicken, return to a boil, and become clear. Stir in the lemon zest off the heat, than scrape the thickened raspberry mixture into a bowl . Press plastic directly against the surface and let the mixture cool. When the mixture cools, you'll stir in the remaining fresh raspberries. For the pastry cream, combine the milk, cream and half the sugar in a small saucepan and whisk to combine. Place over low heat and bring to a full boil. Meanwhile, in a bowl, whisk the yolks and the remaining sugar. Sift the flour over the mixture and whisk it in. When the milk mixture boils, whisk it into the yolk mixture. Strain (I just poured) the pastry cream back into hot pan and place over medium heat. Use a small pointed end whisk to stir constantly, being sure to reach into the corners of he saucepan until the cream come to a full boil and thickens. Continue to cook, whisking constantly, for 30 seconds. Off the heat, whisk in the vanilla. Scrape the cream into a glass bow and press plastic wrap directly against the surface. Chill until cold. To finish the pie, whip the cream the sugar and vanilla to a soft peak. Evenly spread the cooled pastry cream in the bottom the full baked pie crust. Fold the fresh raspberries into the cooled, thickened cooked berries (if you haven't already) and spread the fruit on top of the cream. Re-whip the cream if necessary and spread it over the berries. Keep the pie at a cool room temperature until serving time (I put it directly in the refrigerator). Refrigerate the leftovers. Note: I didn't strain the hot pastry cream back into the pan, I just poured it in. Subsequently, I had some lumps! I could have strained the mixture again when thickened, but I just ignored the lumps and they kind of went away once the pie was fully assembled. Hi Emerald! Glad you enjoyed Nick Malgieri’s crust. I want to try his olive oil crust recipe but still haven’t gotten around to it. About the raspberries, the recipe did not say to strain the raspberries at any point. The pie has lots of seeds in it. I personally didn’t care for the seeds, but my husband didn’t mind them. Maybe seeds vs. no seeds is subjective? But no, it doesn’t say to strain. Basically, you are liberating some juice from the berries by boiling them (with sugar) over the stove. You pour a little of the hot juice into your cornstarch & water mixture, then add that cornstarch/water/juice mixture back in with the berries. At the end, you add fresh raspberries to your thickened juice mixture, so there’s no way of getting around the seeds and no need to strain. Hope that helps. Hello! I just made that pie crust and it was good. Like many others, I found it a bit difficult to roll out the dough.I used it for my Thanksgiving apple pie.YUM! In s step number 9 for the raspberry pie, do you strain the raspberry juice before adding it to the cornstarch & water? Thank you for your help. I would like to make this pie for a Christmas party. Hi Katie! I got really into pie baking about two years ago, but up until then the process of making cookies and brownies was more enjoyable for me too. Pie baking requires a little more practice and is more like an arts and crafts project because of all the rolling and shaping. As far as ease of preparation, I found this one to be about a 3, but if you’ve never made pastry cream or fruit filling then it would be a 7 or 8. This recipe seems to make it a little more fool proof. On a scale of 1 to 10, 1 being the easiest pie and 10 being the hardest, where would you say this pie falls? Anonymous poster, yes! That is the reason I use it. Our pie doesn’t get eaten very quickly because we eat very small pieces. I usually end up freezing individual pieces (this one freezes well, btw), but I use powdered sugar so the cream will hold up. Heidi, it’s easy to work with. It had a good flavor and was tender. I personally did find it as flaky as some other crusts (in other words, it didn’t have big flakes falling off like a croissant or some butter crusts), but it was definitely not tough and had a lot of flavor. It kind of reminded me of a shortbread crust without the sugar and in dough form. The baking powder reminded me of a biscuit. Now it’s possible I could have overworked the dough using the blade of my processor and that it would have been flakier had I left larger pieces of butter, but I don’t know. I’m not complaining because it was still very good and I plan to use it again. The flavor was better than a shortening crust, but it’s still hard to beat the light texture of a shortening crust. I actually prefer to use powdered sugar when I make whipped cream! I tend to find that the corn starch in the powdered sugar tends to make the cream a little more stable. that is an interesting recipe for pie crust. Can you describe the texture and taste? And was it easy to work with? I always have trouble with pie crust. I bake all the time but pie crusts scare me!! Isn’t that crazy? I might have to try this one. This entire pie looks delicious. Raspberry is my all time favorite flavor in anything! Thanks for the recipe. I love Nick’s recipes – they never fail, and his crusts always come out perfect! This pie looks amazing! So pretty.